They know whodunit! It was the vacuum cleaner! In case you think I’m talking riddles, read on. And otherwise, read on as well. Some of you may remember the fire which tore through the Cutty Sark in London in May 2007. Fortunately, due to an extensive restoration program, more than 50% of the ship, including all the masts and rigging, was in storage off-site, so the damage, severe though it was, was limited to the decks and hull. Extensive forensic research has pointed the finger of blame on an industrial vacuum cleaner, which was left on overnight and caught fire. The Cutty Sark Trust is very optimistic that the ship will be put together again, but it will of course cost a lot more time and money than envisioned before the fire. With a bit of luck, the ship will open to the public in 2010. Wi usquabae, we’ll face the Devil! Now aware of his presence, the witches pursue Tam who gets on his horse and flees for his life. As he comes to a river, he steers his horse towards the bridge, because witches can’t cross running water. Nannie manages to grab Tam’s horse by the tail with her left hand, but the tail comes off in her hand and Tam escapes. It has been suggested that the inspiration for Nannie was a friend of the bard, Katie Stein, who was related to the Stein family of whisky fame. Unfortunately, there is no evidence for such an interesting link between Burns’ poem and whisky. The best guess among authorities on Burns is that he modelled Nannie on Katie Steven, a local fortune-teller and smuggler’s accomplice. Maybe Katie worked an illicit still? Whatever the inspiration for Nannie, she and her cutty sark provided the name and figurehead for what was to become one of the most famous tea clippers: the Cutty Sark. Built at the Scott & Linton shipyard on the Clyde at Dumbarton, for a contract price of 16,150, the Cutty Sark was to join in the annual race to bring tea from China to Britain. She was launched November 22, 1869, and set out to challenge the ship-to-beat in the tea races, the Thermopylae. Two on-board traditions kept the link between the ship and the character in Burns’ poem very much alive. While in port, an emblem made of metal in the shape of a shirt was carried on the main mast to distinguish the ship from a distance. Also, crew members often made a ‘horse tail’ from some old pieces of rope which was placed in the figurehead’s left hand. In 1895, she was sold to the Portuguese and renamed Ferreira. However, in one way she kept her old name: the nickname given to her by her subsequent crews was pequina camisola, meaning ‘little shirt’. She was again sold on in 1920 and renamed Maria do Amparo. In 1922, in a dilapidated state, she was bought from her Portuguese owners by Wilfred Dowman for the sum of 3,750. 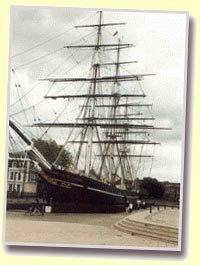 He reinstated her original name Cutty Sark. After rerigging she served as a training ship for the Incorporated Thames Nautical Training College. In the 1950s she was donated to the Cutty Sark Society, with the aim of restoring her to her former glory as a tea clipper. A dry dock in Greenwich, London was to become her final mooring place and she is now open to the public as a museum ship. The Cutty Sark may not be the only surviving tea clipper in the world for much longer: as I write this, plans are being drawn up for the restoration of the Cutty Sark’s sister ship, the Carrick (built a few years earlier under the name City of Adelaide), whose remains are in an appalling state. Many whisky books tell the story of how they chose the Cutty Sark as the name and emblem for their whisky, how the vivid orange-yellow colour of the label was due to a printer’s error, how the whisky was smuggled into America, primarily via the Bahamas (don’t forget, it was the 1920s: there was Prohibition there! ), and how it became one of the world’s leading blends. In a way, Cutty Sark has repaid its debt to the memory of her sailing namesake by sponsoring the annual Tall Ships’ Races since 1972. If it hadn’t been for a separation in time, the Cutty Sark and whisky would have been almost neighbours: Dumbarton grain distillery is built on the site of a disused shipyard close to the site of the Scott & Linton shipyard. Whether Cutty Sark contains grain whisky from Dumbarton (or has done so in the past) is one of those questions in the whisky business that will not easily get a definite answer … Similarly, whether the Cutty Sark ever contained whisky as part of her cargo we may never know. She sailed to bring back tea and wool, but of course was not empty on the voyage out. Capt. Waite, the present master of the Cutty Sark, told me that none of her cargo manifests or bills of lading are known to have survived and all that is known is that she carried ‘manufactured goods’ on her outward sailings. From a cutty sark to a dram of Cutty Sark, with more than 200 years between them. I’m pretty sure Rabbie would have been amused to see the wanderings of Nannie’s clothes. An intriguing question remains: did Francis Berry, Walter Berry, Hugh Rudd and James McBey know in 1923 that they were actually naming their whisky after the shirt of a beautiful, scantily-clad witch? The label of Cutty Sark Scots Whisky could have looked very different! !